I think it might be time to see the doctor. That is if I can get an appointment in this century ….. 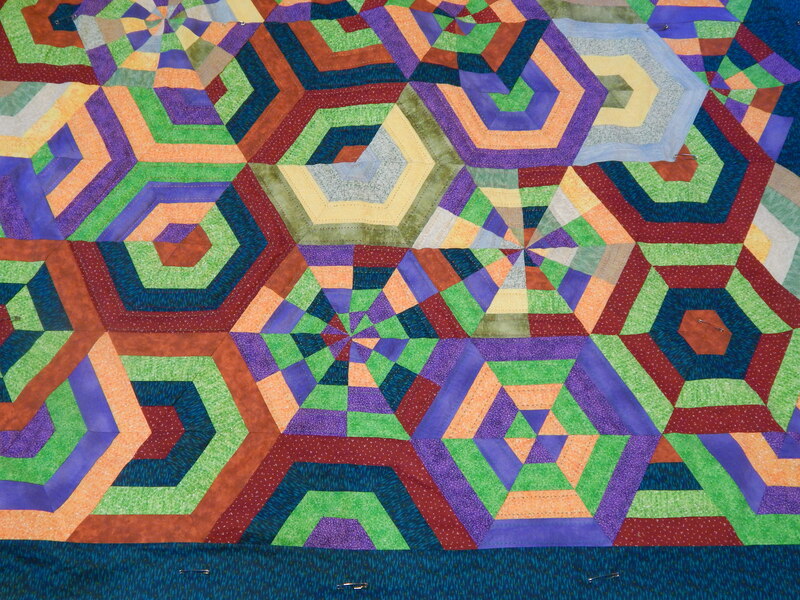 I have not been able to do any quilting in the frame because I have to bend slightly to do it and it pulls my back just enough to make it hurt. I have however found that it is impossible for me to sit and do nothing. I have forgotten how to just watch TV. So I decided to start the hex strip quilt. 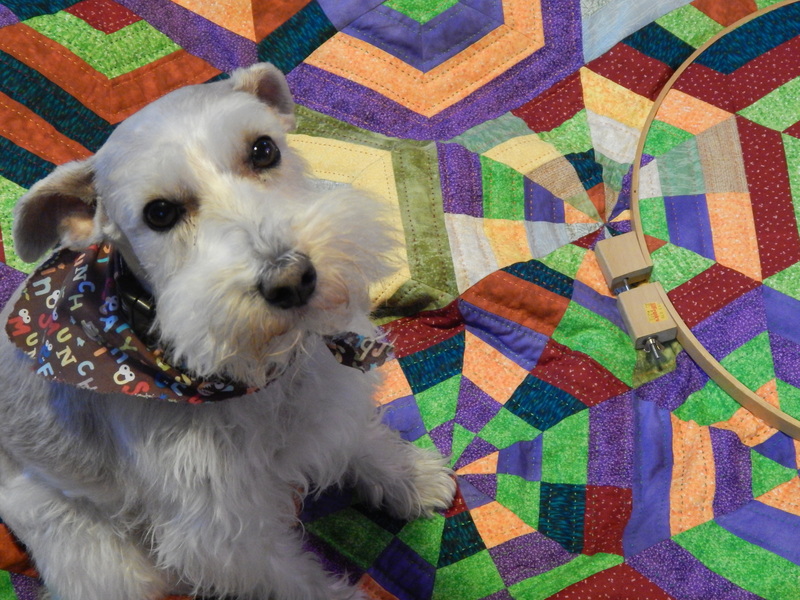 The quilting is very simple and I can do it in my hand held hoop and hold the hoop way up so I don’t have to bend forward at all….but it is very slow. 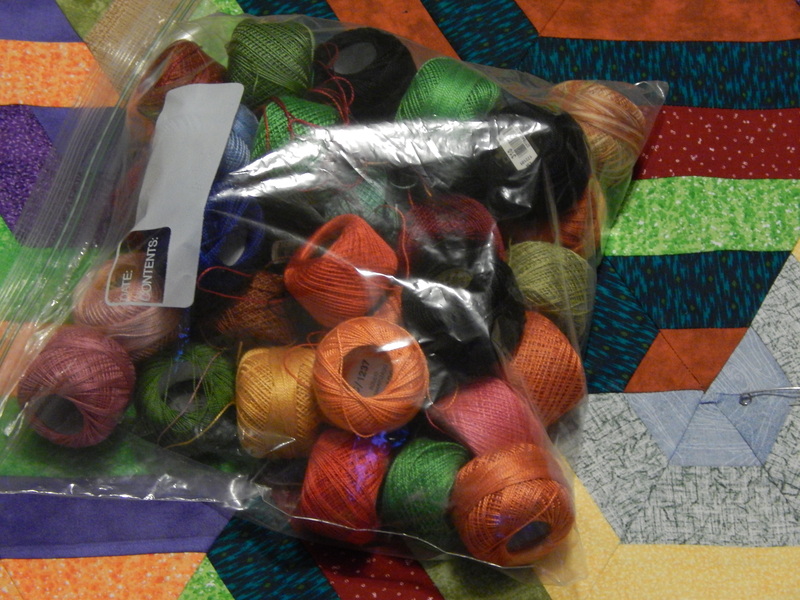 I am using assorted colors of perle cotton thread. I like how it is looking. I’m sorry to hear that your back is giving you trouble. I hope you’re feeling better soon. Get better soon. 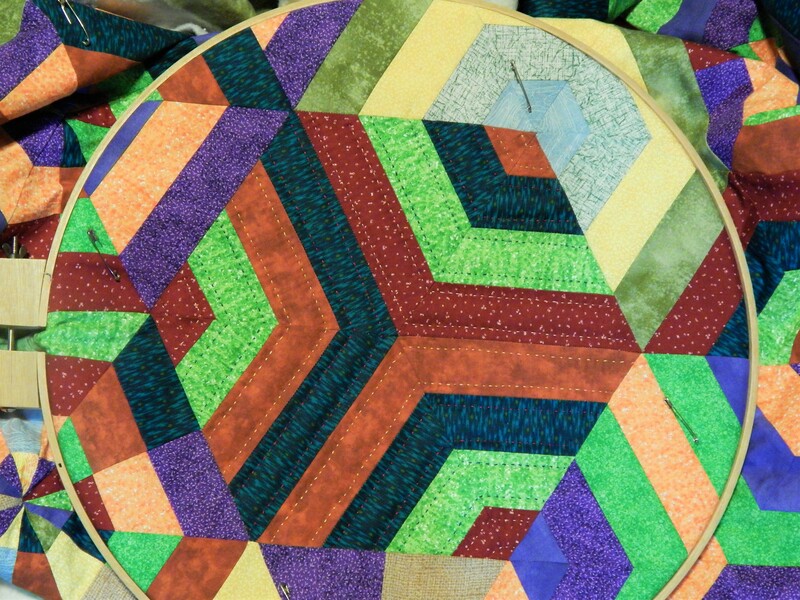 A sore back is the worst for a quilter. Maybe all of the yard work this summer has caught up to you? So sorry to hear this Tim. You’re been doing too much gardening! I know how back pain feels as it’s something I’ve been dealing with for years. I am like you too in the second way in that I CANNOT just sit and do nothing. It just doesn’t work for me either. So I either hand quilt or work on my paper piecing on the worst days. Even with a high table, cutting bothers me most of all even on good days.. So I spread out that chore a little at a time. Maybe it’s time to start that heirloom grandmother’s flower garden hexie quilt…? You can apply your bionic speed-stitching skills to making up baskets and baskets of EPP hexies while you listen to music, watch (sort of) TV or chat to friends. When I was having chemo 3 years ago, it was about the only thing I was strong enough to do, and it meant I ended up with something beautiful out of a very dark time in my life. Hope the doctor can help you. 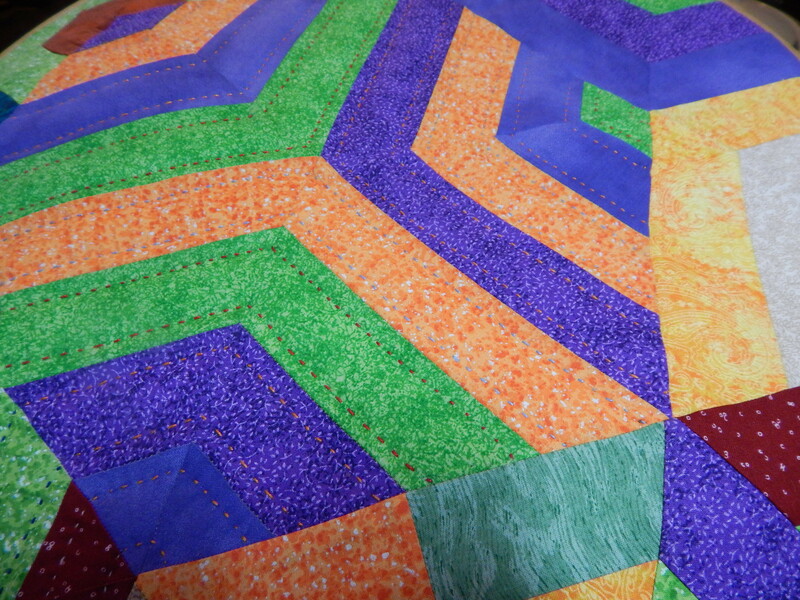 The last two times I have been in with quilting related ailments, the doctor has suggested rest and no sewing. Very difficult to do when I enjoy quilting so much (or I have a deadline). Get well soon! Let the weeds grow and the quilts pile up and you will soon get better. Been there done that! Heat pad…….hope you feel better soon…. Do the rule of three. Three alive three times a day for three days. If it isn’t better, then call the doc. Oh dear,back pain is no fun! Sure hope it doesn’t last long. Take care! Stitching on quilt is lovely. Hope you’re better soon. Are you using all the cotton threads to quilt? 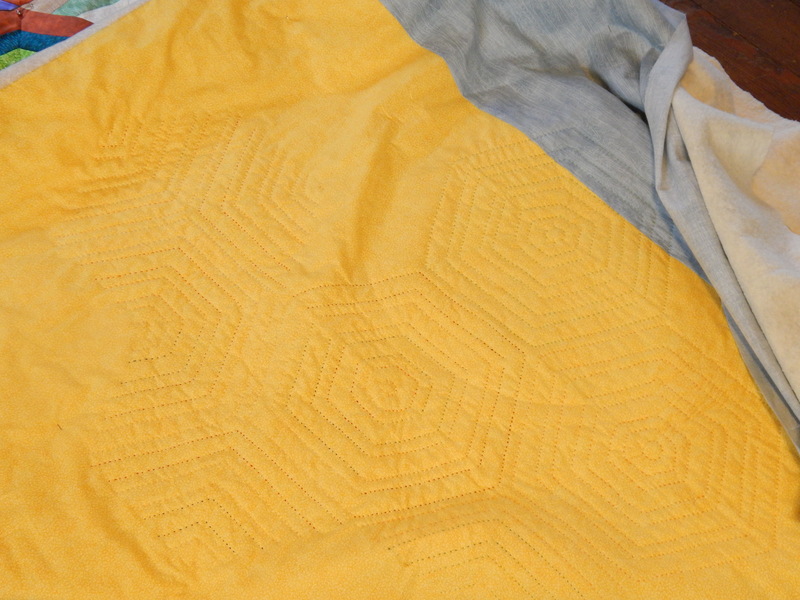 On the yellow back the quilting looks the same color. Sometimes it works itself out. I hope it does for you, What you do can not be delegated, so hoping all will get better. I would miss your posts, selfish of me I know but Teddy hopes you will get better, he probably knows that you are hurting.. With all the useless emails I get I always look forward to yours. I wish I could forget how to do nothing. I am quite good at it and just finished watching Martin Clunes as Arthur Conan Doyle on PBS production of George and Arthur. Quite good and from a Book I read some years ago. Hope you feel better soon, Tim. 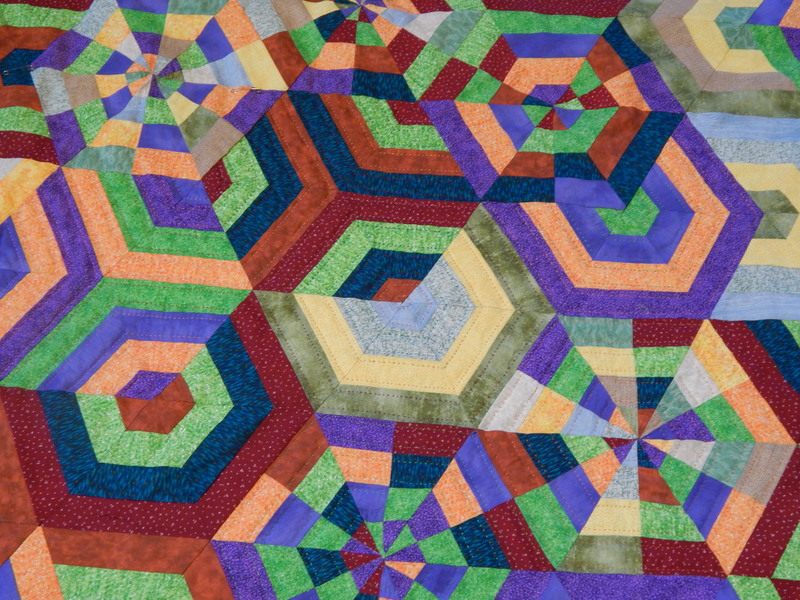 So glad you can quilt on your hexie quilt. It looks great! An appointment? Just go to the chiropractor. The longer you wait, the harder is to heal. I guess this is probably not the first time and you already know this. As for doing nothing, maybe this is the perfect opportunity to retrain yourself. Meditate. Please, take care of yourself. Teddy and us need you. Many many good wishes for your speedy recovery. Your unbelievable skill and quiet voice, and lovely Teddy, are so important to so many people. Please take care of yourselves. You call that slow!?!?!? It is still much faster than anything I could do; you have accomplished quite a respectable amount even while crippled. It must feel satisfying to create such beauty in stitches. I am not alone in being an expert in back pain. I agree with the person who suggested anti-inflammatory treatment: a lot over a short time is more effective, and safer, I think, than a little for a long time. I favor ibuprofen. I also think a trip to the doc is a good idea, and a referral to physical therapy. Physical therapists know so much more now than they did when my back started giving me problems. You could learn tricks that would make you an even stronger quilter, if that is possible, in return for the sacrifice of time away from doing the things you love. I think gardening is good for your back, too, (though not right this minute) and you already do that. Above all, know that this pain won’t last forever. Bio Freeze, heating pad and maybe a soak in a hot tub. Back pain is terrible. Maybe too much gardening? I haven’t tried quilting with pearl cotton but I really like the look. Hope you feel better soon! Back pain is terrible as said above. I’m sorry yours hurts. Of course we all wish it to be better soon. Hope your feeling better. I have spent.t 4 months in physical therapy and the heat and exercise really helps. Sometimes doing other things gives one a boost to feeling better. Your work is beautiful, Teddy is handsome AND I hope you feel better soon! I hear what you’re saying on doing nothing. In the evening, the only time I actually sit down for 2-3 hours in front of the tv, I’m knitting or doing needlework of some kind. Doing nothing is difficult and painful in a different way! I hope your back problem is resolved soon. Tim, I can’t simply sit and “do nothing” either. I keep an applique or knitting project going at all times for my evenings in front of the tv with hubby. Don’t put off seeing the doc. Get well soon! Age appropriate pilates or yoga class given by well qualified instructors will do wonders. Love all the work you do. Teddy is adorable too! Hoping you will feel a lot better soon. It must be very frustrating for you. Hope you’re feeling better soon. A good physical therapist can give you some stretching/strengthening things that will counteract the sewing and gardening activities. Swimming works well for me but you may not have a lap pool nearby? So sorry about the back. Hope it is healing now. I was down with that for six weeks in early summer. I layed down a lot doing needlework. I like your hand quilting however. That quilt is really fun and wonderful! Just checking on you Tim, hope you are better. Miss your blog and Teddy….. Keep getting better. My blog reader seems to have repeated some posts but I am sorry about the back…. bad backs are a bummer….. so often it is rest that helps…. one bad muscle pinch took seven years to “work itself out”. That of course is no encouragement, but in the end I was so pleased that it actually got well.